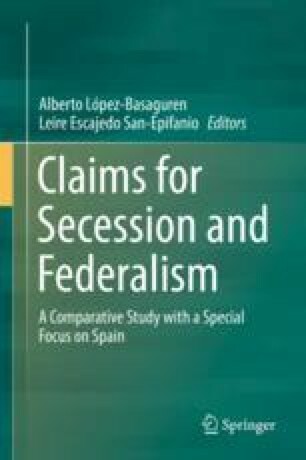 This text aims to analyze whether constitutionalizing a secession procedure is an adequate way to harmonize the roles of constitutional legality and democracy in regard to the secular territorial debate in Spain. The main reason for a positive answer to that question is the current blocking of the territorial debate in multi-ethnic Spain and the view of secession procedure as a legal tool to strengthen the binding force of the Spanish Constitution, threatened by separatist movements. As long as the constitutional amendment procedure helps in democratic States to preserve and safeguard the differentiation of the legal system, becoming a legal path to express the will of the people’s constituent power as a legally constituent-constituted amendment power, and as long as the Spanish Constitution lacks absolute substantial limitations upon the constitutional amendment, in particular national unity, a right to secede may be constitutionalized using the aggravated constitutional amendment procedure of art. 168 SC. The future constitutional clause on secession, which should be coherent with the remaining constitutional principles and values, will constitutionalize the external right to self-determination of the Spanish Peoples, nowadays organized in Autonomous Communities, and will allow them unilaterally counter the binding force of the Spanish Constitution over their territories. This secessionist decision shall take place in two decisive steps through a constitutional amendment procedure set by the constituent power of the Spanish People: initiative one by the qualified majority of the regional Parliament’s representatives; and decision one, voted in a referendum by the qualified majority of the Territory’s electors. In between these two stages an intermediate negotiation phase of 2 years should take place, in which the seceding territory and the Spanish central Government must negotiate in order to find another non-secessionist type of constitutional amendment that could prevent the secession or, if this is not possible, the concrete conditions of the secession.